A month or two ago, you might recall, Get to the pub.com featured the Sycamore Inn in Parwich, Derbyshire. I noted happily that the Sycamore had stayed alive in an isolated rural location by doubling as a village shop and community centre, with support from an excellent scheme called Pub is the Hub. This week I’ve noted rather less happily that Pub is the Hub has become effectively defunct because of government spending cuts. The £4.2million involved is petty cash within the bigger picture of public finance (compare, for example, the cost of the Pope’s visit to the UK next month, which is expected to come in anywhere between £12million and £100million). And Pub in the Hub seems a classic example of how communities can run services and amenities themselves. But it seems that Cameron’s Big Society has no place for pubs. Also, did you realise there was a Minister for Pubs under the last government? If only they’d done their communications and publicity a bit better, and the voters had known there was a Minister for Pubs. The general election might have turned out quite differently. So to this week’s pubbing. 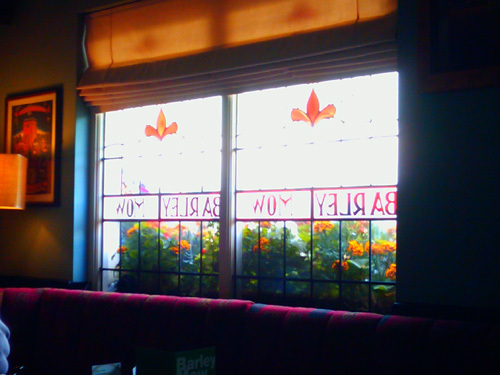 Monday’s visit to the Barley Mow in Chesterfield might be the basis for the next featured pub on this website, so I shan’t bang on about it here. Not spectacular, but not a bad place. Let us move on to Tuesday, back in Sheffield, and the Freedom House, where this time it’s the gaffer asking the questions in the quiz. And this time it’s in the lounge, not the bar. It’s a small enough room for the gaffer to dispense with such fripperies as amplification and go unplugged. I’m on the same two-strong team that swept to victory two weeks ago. But this time Dan and I face greater competition. The place is awash with those beardy, academic-looking specialists who take the whole thing too seriously – the types who descend on pubs that aren’t their local just for quiz nights and ruin the regulars’ chances of ever winning something on their own patch. We score better than last time – and in another complete departure from our previous performance, some of those points actually come from answers given by me. But we come up short on a question about Andy Warhol and trail the winners by two points. Not that I’m bitter about those quiz specialists in any way, you understand. Friday Lunch Club at the University Arms is notable for the best beer I’ve had all year. It’s the American Pale Ale from the Dark Star Brewing Company. Dark Star’s website is an annoying Flash affair that’s at least five years out of date, but their American Pale Ale is a classic. It’s thirst-quenching, it’s light but full of flavour and just deliciously bitter enough to keep you supping. Good job I’m only here an hour, or this stuff would cause me to overindulge horribly. All of which throws Sunday’s visit to the Benjamin Huntsman into stark relief. My girlfriend’s parents are here and they don’t understand pubs. So the only strategem open to me to avoid a Toby carvery is to offer a visit to a Wetherspoons. It’s like when you’re playing chess and you sacrifice a rook to save your queen. And what makes Wetherspoons bearable? The decent beer. (OK, they ruin it by serving it too cold, but at least it’s decent beer ruined, rather than just rubbish beer to begin with.) Not today though. A compressor is broken, whatever that means, so all the cask ales are off. What also makes Wetherspoons bearable? Cheap, half-decent food. Again, this isn’t happening today. My sweet potato and chickpea curry costs about £6.50, takes 20 minutes to arrive, and comprises a huge plate of rice, naan and popadums with a negligible pot of curry loitering apologetically to one side. A bit like I do around my girlfriend’s parents.